YVO’S SHORTIES #32: Charlie And The Great Glass Elevator & Oh, The Places You’ll Go! Time for another round of Yvo’s Shorties: Children edition! I realized I have barely read any MG or Children books in the first half (only the one), so I decided to remedy that by reading not one but two what you call classic children stories. I must have read Charlie And The Great Glass Elevator by Roald Dahl at least a dozen times as a kid… I was a huge fan of his work and it’s always been great to revisit the stories. This one is not my favorite, but still entertaining enough. And I’m almost ashamed to admit I haven’t had contact with Dr. Seuss‘ work as a child, but it’s good to finally discover it now. Better late than never right? Roald Dahl was one of my childhood favorite authors, and I must have read his books hundreds of times over the years. 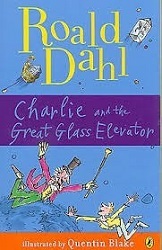 I have read Charlie And The Great Glass Elevator multiple times as well, although not as many as some other titles. I didn’t remember why, but now I’ve had the chance to reread this story as an adult, I do understand. While without doubt still an entertaining story with the wonderful illustrations of Quentin Blake and the same writing that is able to enchant child and adult, I don’t think it’s as strong as his other books. Or in fact the first book and highly popular Charlie And The Chocolate Factory. After such a strong first book, the sequel falls kind of flat for me and doesn’t have the same magical feel despite the space adventure. It’s not a bad read and children will still enjoy it, but they probably won’t ask you to read it over and over again unless they are obsessed by anything space related. Title: Oh, The Places You’ll Go! I’m almost ashamed to admit I haven’t had contact with Dr. Seuss‘ work as a child other than a movie/cartoon or two… It might be too late to remedy that, but better late than never right? 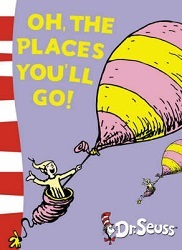 I was lent a copy of Oh, The Places You’ll Go! and I’ve been looking forward to pick it up. As someone who has had the travel bug for a long time now, I thought it would be an appropriate read, but what I didn’t know is just how much I would be able to connect to this picture book. For a story that is ment for such a young audience, it is surprising just how much you will be able to relate to the underlying message as an adult. The illustrations and easy and well written prose are to help kids understand and enjoy, but I truly think this is a story for all ages. Oh, The Places You’ll Go! has a strong moral message and shows us that there is a whole world out there… Waiting for us to just step outside and discover it. Ups and downs are normal, but the thing is to just keep going. This one will go straight to my must-read list for any future kids we’ll be having one day. 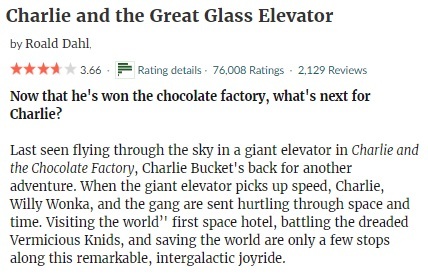 This entry was posted in 2018, 3 Star Rating, Book Reviews, Yvo's Shorties and tagged 3 star rating, 4.5 star rating, book review, charlie and the great glass elevator, charlie bucket, children, dr. seuss, fantasy, fiction, oh the places you'll go!, published in 1972, published in 1990, roald dahl, series, Yvo's Shorties by Yvo. Bookmark the permalink. I’m glad I finally gave it a go! I was surprised by just how easy it was to relate to the story as an adult as well. 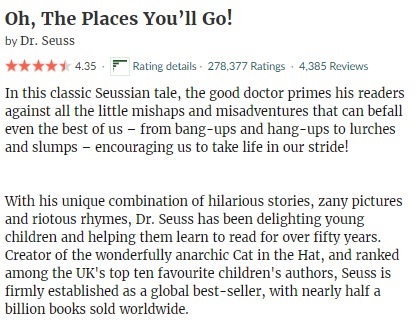 Oh the Place You’ll Go is one of my all time favorite books! I can see why! I really enjoyed it as well. Yeah the same happened to me… I guess Dr. Seuss wasn’t as popular in the Netherlands when I was young or at least I don’t remember any translations in the library… I would probably have loved these as a kid as well. Roald Dahl is great! My favourites are Matilda and The Witches.